On 2008’s hot single “Bassment Party,” and with almost prescient clarity, The Cool Kids taunted “When [our] album drop? You can wait on that.” And wait they meant. 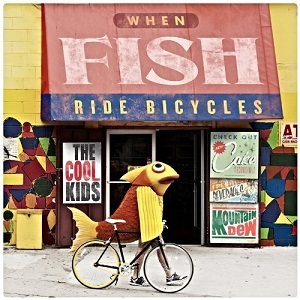 Fast forward three long years later and the Kids’ When Fish Ride Bicycles is easily one of the most anticipated rap releases of the year. Fans have been clamoring for this record since Chicago’s Chuck Inglish and Mikey Rocks first jumped on the scene with 2008’s Bake Sale, and aside from a couple of mixtapes in the interim that only served to mildly satiate the public demand, the Kids have been oddly silent. Their time away, flying mostly under the radar was well spent, with Inglish and Rocks clearly maturing, working on and refining their already unique style. The result? One of the best rap albums in recent memory; and with the July heat well upon us, When Fish Ride Bicycles will be the summer jam for many an all-night party. In that three year span, the Kids haven’t been slouches outside the studio either, recruiting many top caliber guests including Wu Tang’s Ghostface Killah, Bun B of UGK fame and perhaps most notably singer/producer/rapper extraordinaire Mayer Hawthorne on “Swimsuits” certain to be one of the hottest singles of the summer. The track brings everything that fans have come to expect from the Kids to date: smart and clever lyrics, tight rhymes, great beats and super catchy hooks. “Swimsuits” will grab you and force you to uncontrollably bob your head up and down, demanding repeat listens at a high volume. If, as they said in 2009’s mixtape release Popcorn “we outside of your house, it’s The Cool Kids and we here to jump on your couch” then in 2011 they are fully knocking down the door and bringing the entire show inside with When Fish Ride Bicycles in tow and, like it or not, throwing one hell of a party. The long wait was more than worth it, and these Kids are back and better than ever with When Fish Ride Bicycles.